Here are two more reviews of film cameras from my collection, revised and improved. 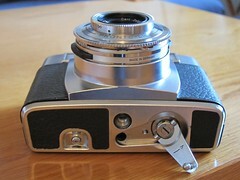 The first is of my Zeiss Ikon Contessa LK, a wonderful viewfinder camera with a built-in exposure meter. It’s a great camera to use, and its lens is wonderful. Read the review here. 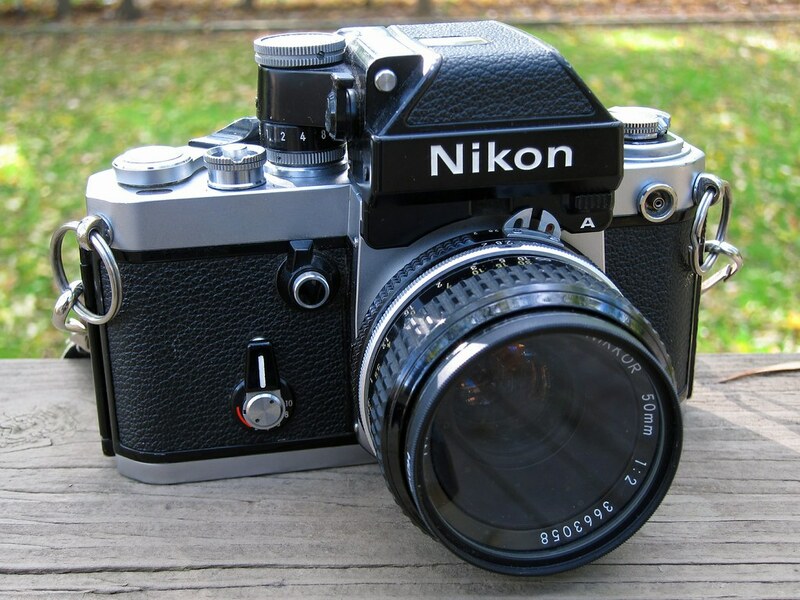 Next up is my Nikon F2A, the F2 with the match-needle A viewfinder head. Mine needs its meter fixed; it works but is jumpy. But it’s a solid camera nevertheless. See the review here. I’ll never forget the first time I came to Indianapolis. It was 1976. My dad’s best friend knew the director of the about-to-open Children’s Museum and had arranged us a preview tour. We had the museum and its exhibits all to ourselves. 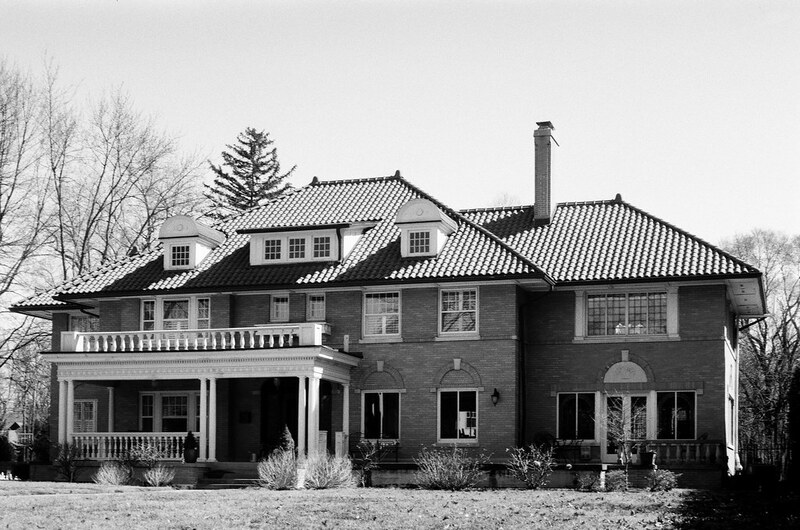 That’s memorable enough — but my other great memory of that day is entering town on US 31, Meridian Street, and having my breath taken away by the stunning homes that line it. 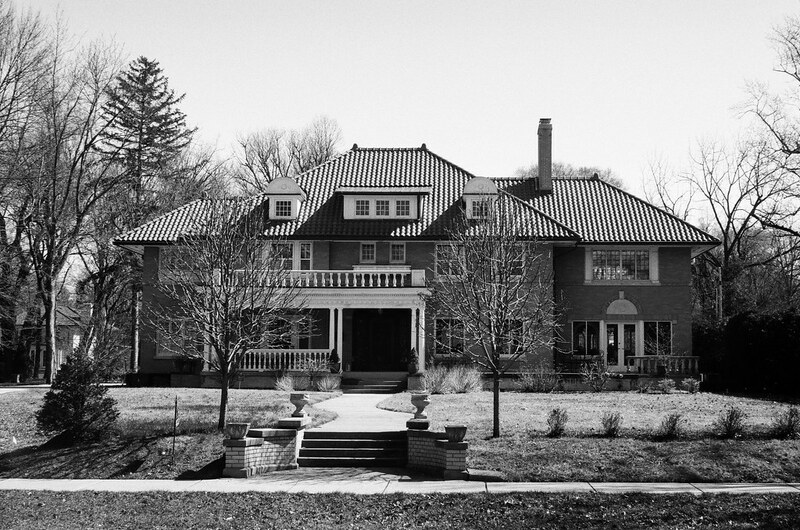 More than forty years hence I still love to drive along Meridian Street to see its wonderful homes. 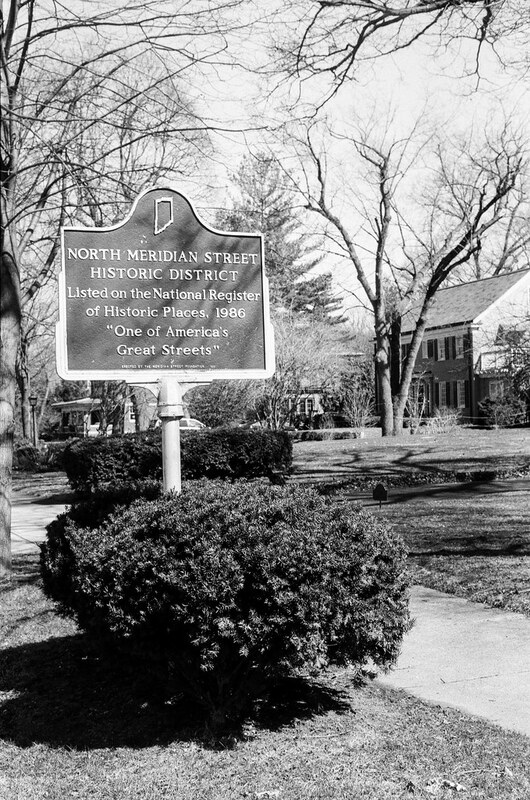 Many of the most expansive and expensive homes are within the North Meridian Street Historic District, which runs from 40th St. north about a mile and a half to Westfield Blvd. 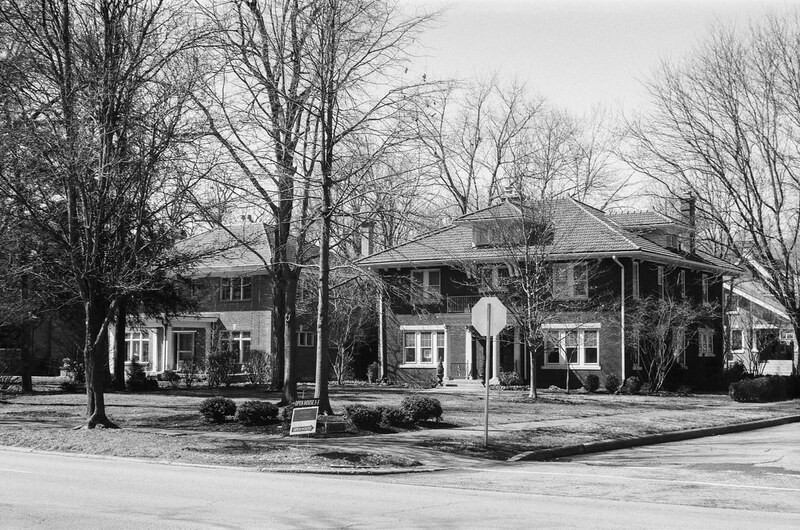 The District’s homes were built between the two World Wars in classical styles. All are large, detailed, and well kept. Here now, a brief tour from a walk I took from 40th St. up to about 46th St.
Margaret and I met my sons for dinner during their recent Spring Break. 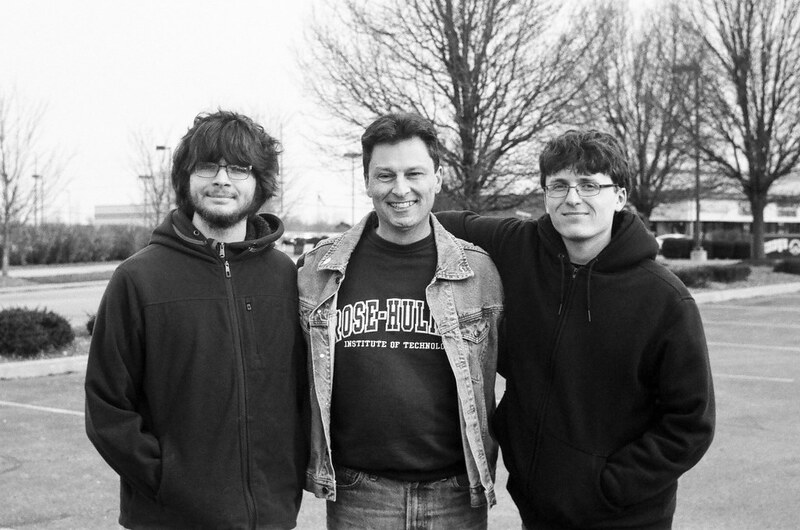 She photographed us with my Zeiss Ikon Contessa LK, a viewfinder camera with a coupled selenium light meter. Before I handed it to her I matched the needle to set exposure, using an aperture narrow enough that it wouldn’t matter whether I guessed distance wrong. It performed, of course, delivering good sharpness, contrast, and detail even on this overcast day. That’s the goodness inherent in a Tessar lens! 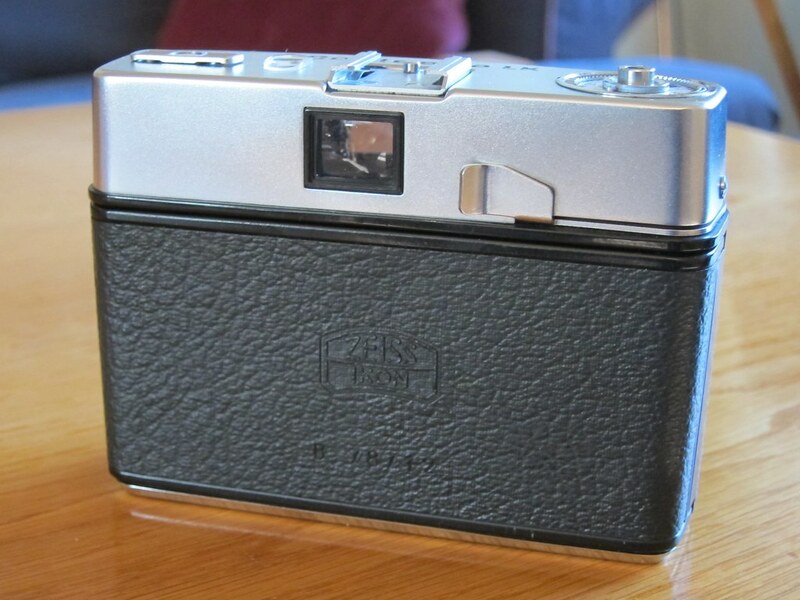 This camera was my first experience with a Tessar. I first shot seven years ago when my sons and I spent our Spring Break in a cabin in the Tennessee woods. 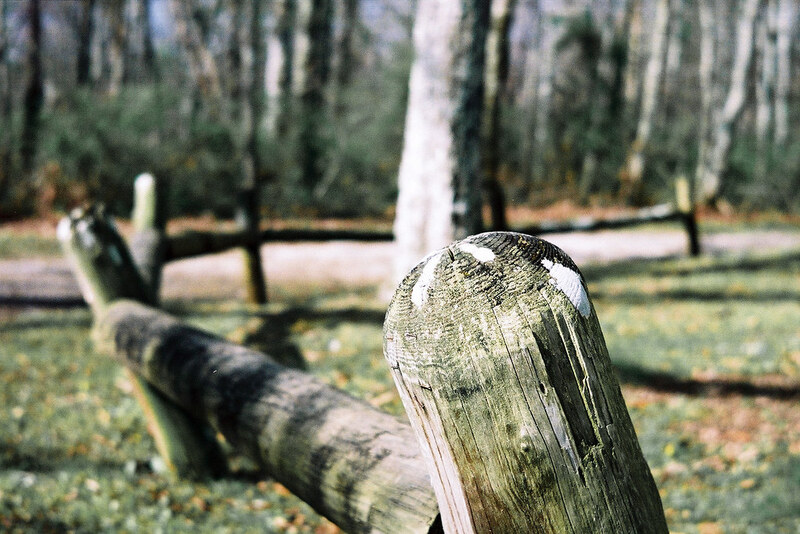 Here’s the fencepost in front of our cabin, on Fujicolor 200. This time I spooled in some Ultrafine Extreme 100 and brought the Contessa along everywhere I went for a few weeks. 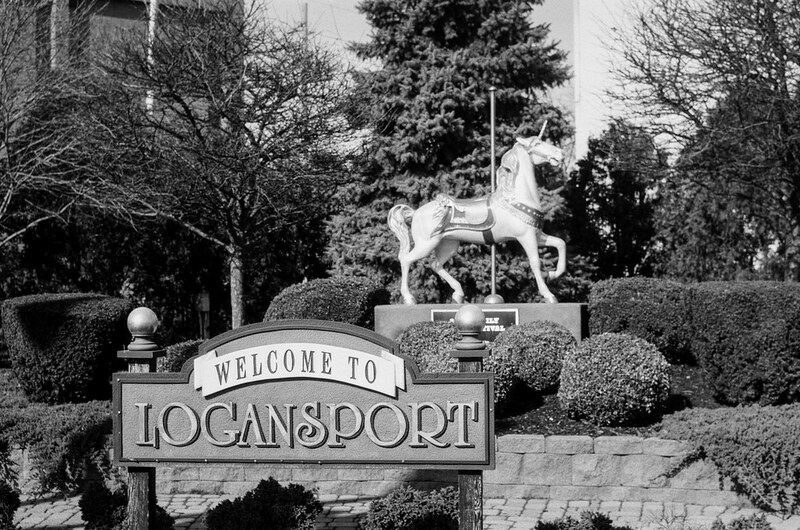 That included my recent trip to Logansport for a Michigan Road board meeting. 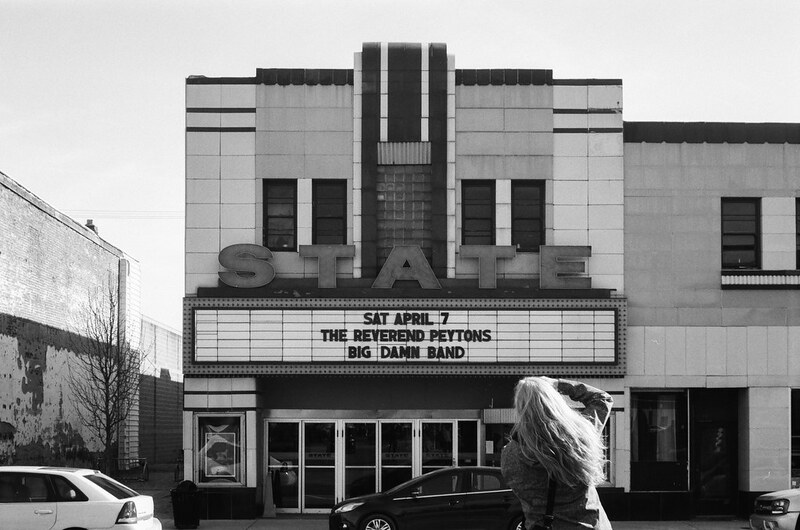 Margaret came along; here she is photographing the State Theater. I do love her long gray hair. 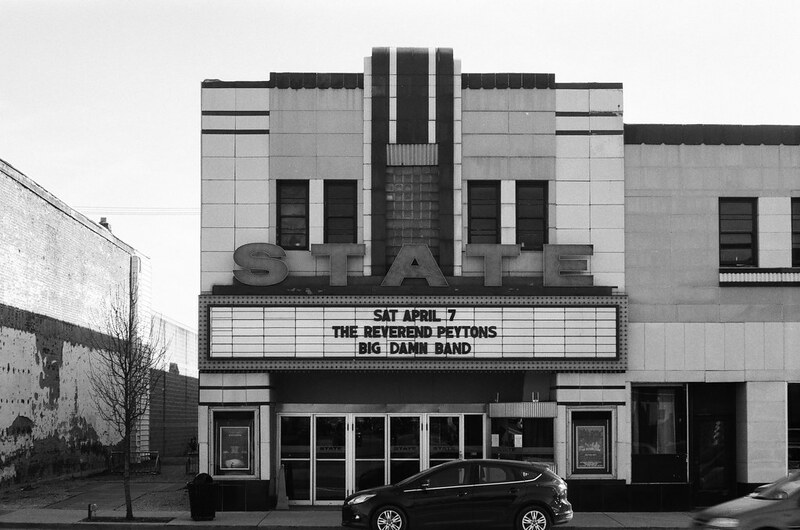 I’d never shot the Ultrafine film before and didn’t know what to expect. The seller is mum on who makes it, but Ilford is the most common guess I’ve found. Some even say it’s Kentmere 100. The last time I used this camera I shot the Kentmere in it (as you saw in yesterday’s post). The results look similar. 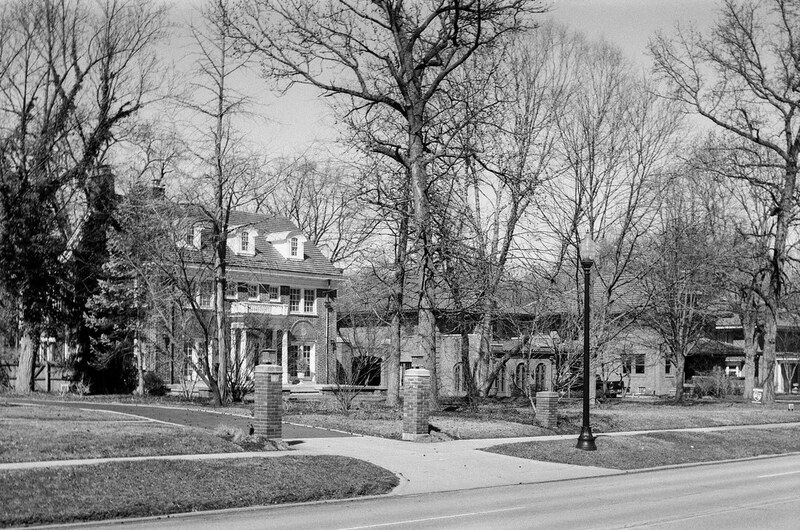 The Contessa was a lovely, willing companion when I took it for a walk along Meridian Street in Indianapolis. 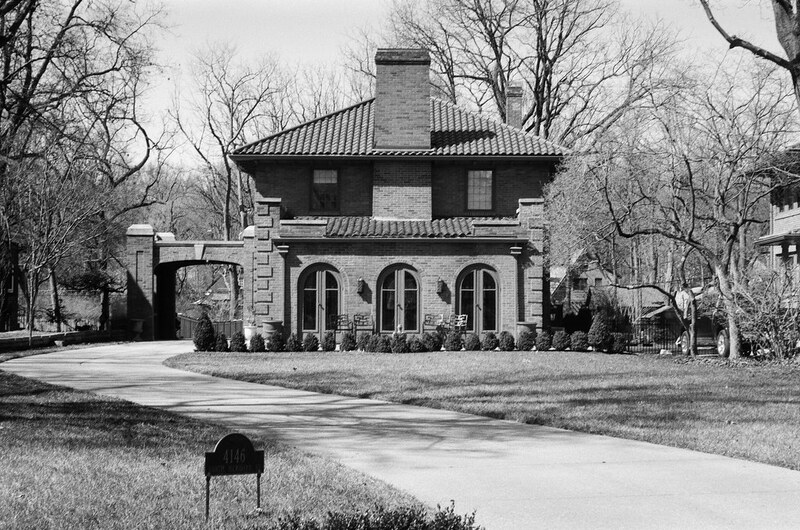 If you’ve never walked or driven our Meridian Street, put it on your list: it is lined with stunning homes. I’ll share more photos from that walk in an upcoming post. I also took the Contessa to the places I usually go. 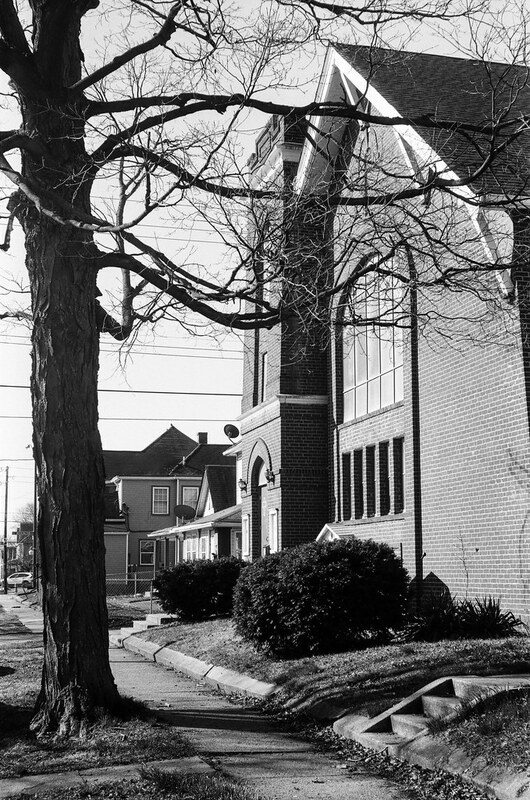 I keep thinking I’m going to find a new, more interesting angle on my church, but I seem never to. Some views always work photographically, and I suppose it’s no sin to keep revisiting them. I’m not blown away by this film — it’s fine, but not fantastic. But the Contessa brought feelings of delight every time I composed, exposed, and pressed the shutter button. I even liked the winder’s long-travel action. Everything about this camera is light and easy, yet still solid and sure. 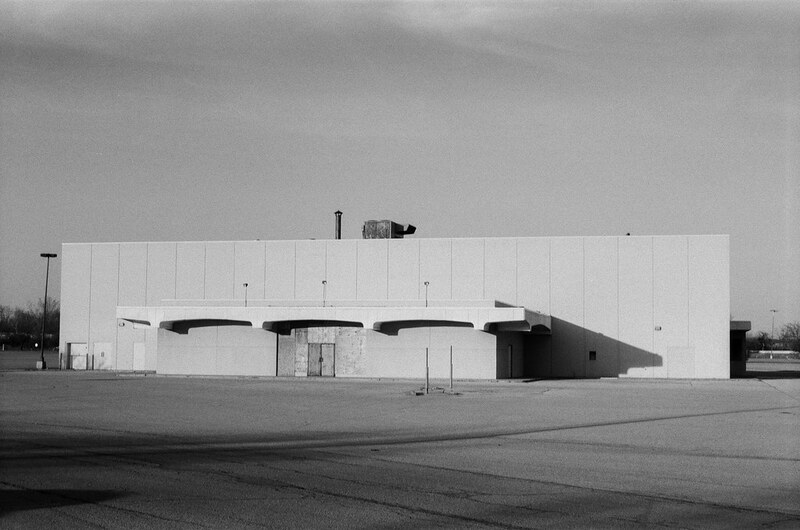 I drive past a nearly derelict mall on the way home from church. This used to be its Sears Auto Center. I remember when Sears closed here. I bought a ton of stuff cheap at their closeout sale. I also remember when this mall was bustling and vital. When I started my career I drove to it all the way from Terre Haute to buy a young careerman’s wardrobe in one of its men’s stores. Harry Levinson’s, I think. But that was almost 30 years ago. Times change. 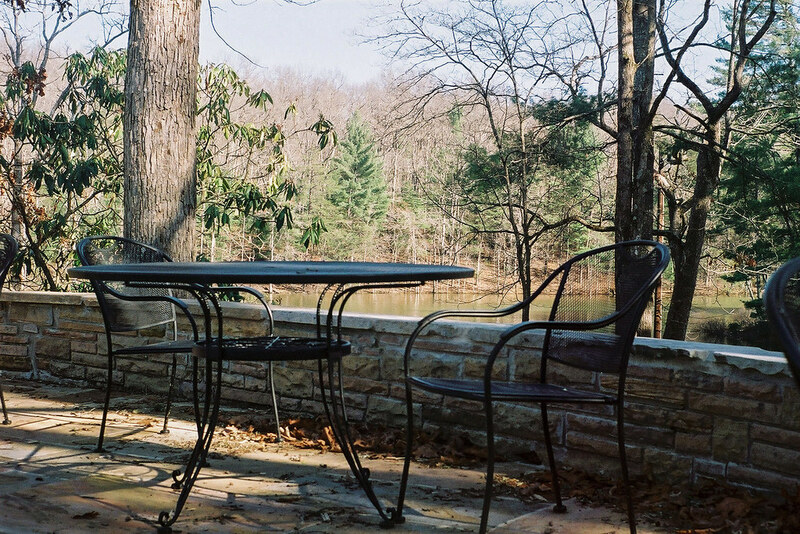 To see more photos from this camera, check out my Zeiss Ikon Contessa LK gallery. Its taken me most of a decade to figure out I should use a camera for what it does best. 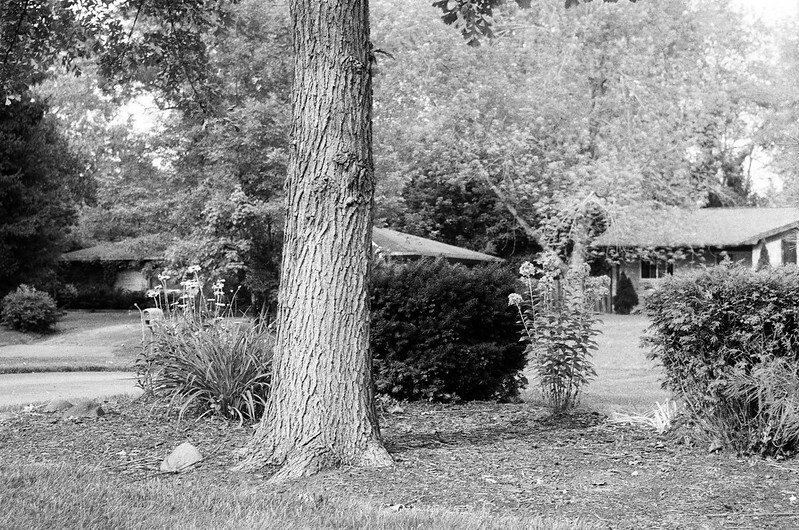 The Zeiss Ikon Contessa LK is brilliant at medium-distance group shots and does pretty well for landscapes and, if you back up enough, architectural work. 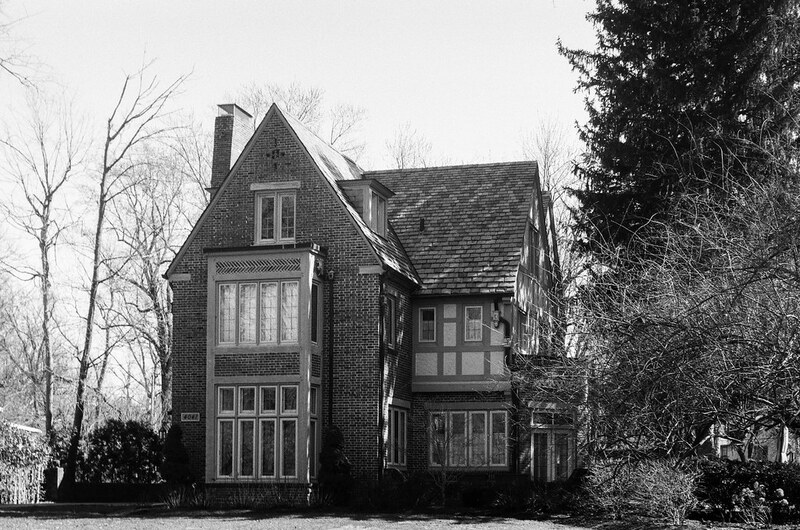 The lens just adores black-and-white film. 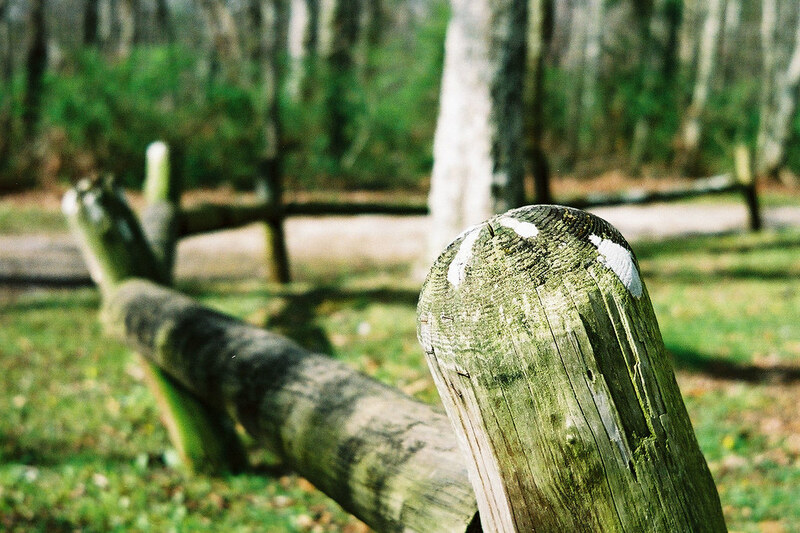 Its only flaw is that whenever I load a 36-exposure roll of film, it tears during rewinding. That’s kind of a bummer. But I always have 24-exposure rolls of film in the fridge. And this camera is just a pleasure to carry and shoot. It’s hard to say goodbye to a camera like that. 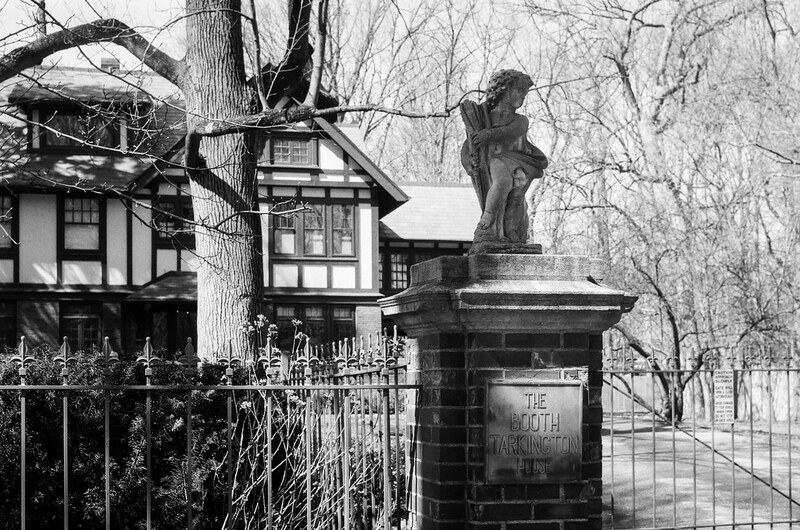 Tomorrow I’ll publish an Operation Thin the Herd report on my Zeiss Ikon Contessa LK. Here’s a frame from the previous time I used that camera. 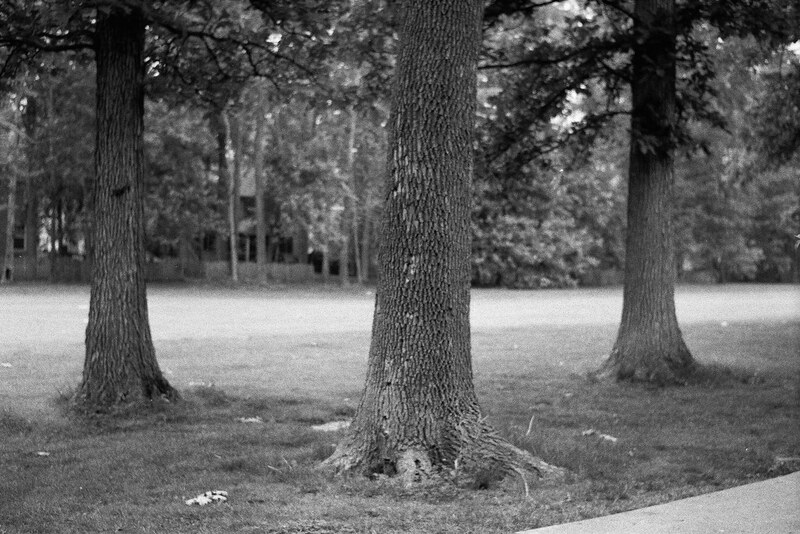 I’m not a giant fan of Kentmere 100 — I’ve had terrible luck with its highlights blowing out. Yet my Contessa managed that well in any light. It seems to “get” this budget film. And just look at the great detail that Tessar lens captured on my former Toyota’s flank. Count those water drops! If you guess focus right, the Contessa does credible close work. But don’t ask it to shoot macro: it focuses down to only one meter. I might have a couple more rolls of the Kentmere in the freezer. I know which camera I’m putting them through. I came upon my Zeiss Ikon Contessa LK recently and decided to shoot it again. I enjoyed the results I got last time on color film and wanted to try black and white in it. This seemed like a perfect opportunity to use the roll of Kentmere 100 that’s languished in my fridge for more than a year now. I liked shooting the Contessa LK as much this time as I did last — it’s a pleasure to use. But while rewinding, I felt the film break. I figured I rewound too vigorously and pulled the film’s end out of the canister. So I stepped into a dark closet and spooled the film into a black film can. I sent it off to Dwayne’s with instructions to open it in the darkroom. 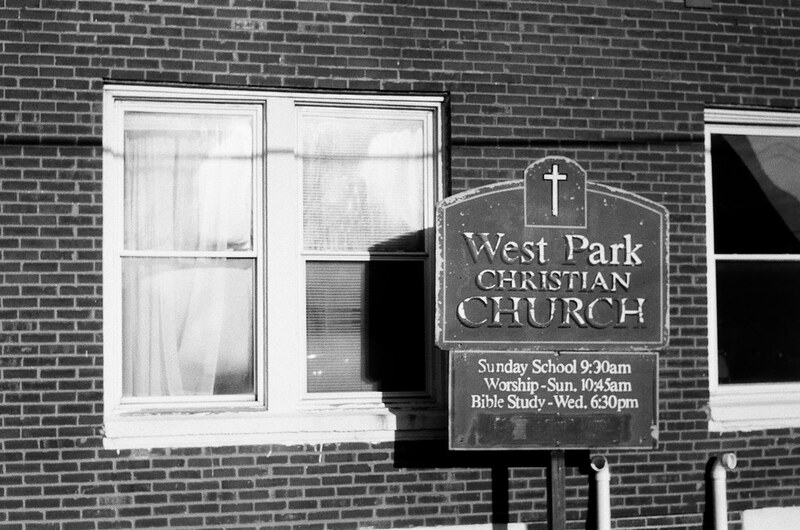 I got just 19 shots, with negatives, back from a roll of 36. The other 17 shots must still be in the film canister! But wait, didn’t I have trouble rewinding film in this camera before? I looked up my review and found that a 24-exposure roll of color film had rewound fine, but a 36-exposure roll of black-and-white film rewound with great difficulty and soon tore. This Contessa LK must not like 36-exposure rolls. I misfocused about a third of the shots so badly that they were unusable. I’ve become a pretty good judge of distance, so I don’t know how I screwed up so many photographs! 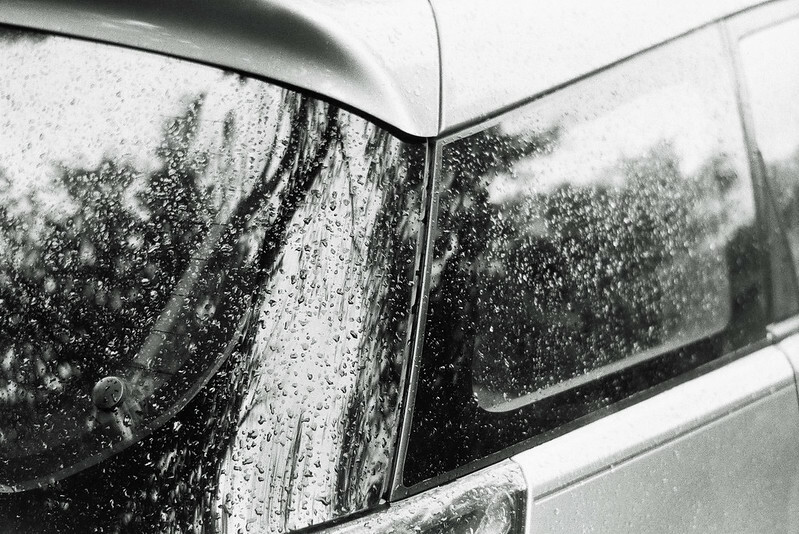 But this shot of the corner of my car after some rain was in perfect focus, with strong detail and good tonality. I like the composition of this shot, which I took Downtown, but it was a little underexposed. I improved the situation in Photoshop but at larger resolution you can see pretty serious grain. I love the sense of depth this photo creates. I shoot these trees a lot as they’re on the golf course directly behind my house. The tree in front is an ash, and it’s been killed by the emerald ash borer. I’m sure the golf course will have it removed sooner or later. Of the shots I focused correctly, many of them had blown-out highlights, like this one. Some of the highlights were so blown that the shots were unusable. That was the big problem I experienced with this film the last time I shot it. Maybe Kentmere 100 just isn’t the film for me. It’s too bad, because it’s the least expensive black-and-white film I can find. 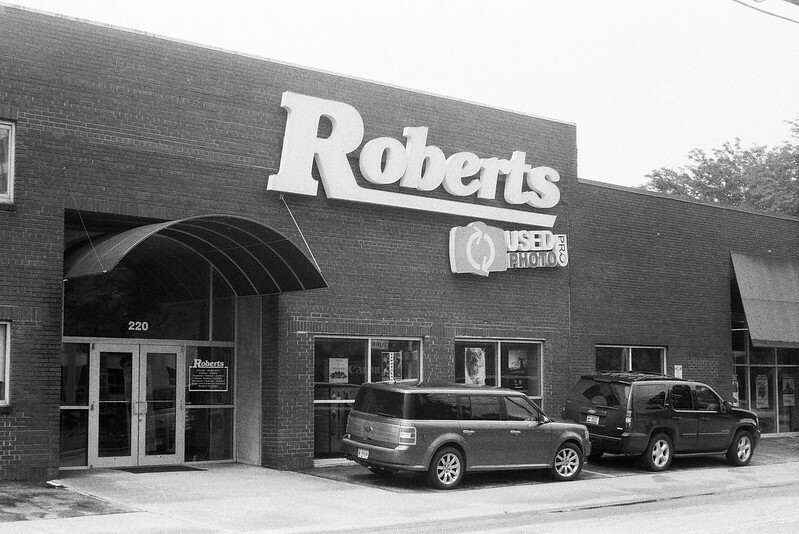 Side note: this is the new location for Roberts Camera, and it’s a lot more convenient than their old location. They’ve been getting my color-film processing business all summer. Unfortunately, they don’t process black and white anymore. I sent the rest of this roll to a different processor, Old School Photo Lab, to see if I got different results. I expected I’d get several photos, but I got just this one. Several shots of my older son must have been right where the film tore. At any rate, I’m impressed with the lab for processing just one frame. 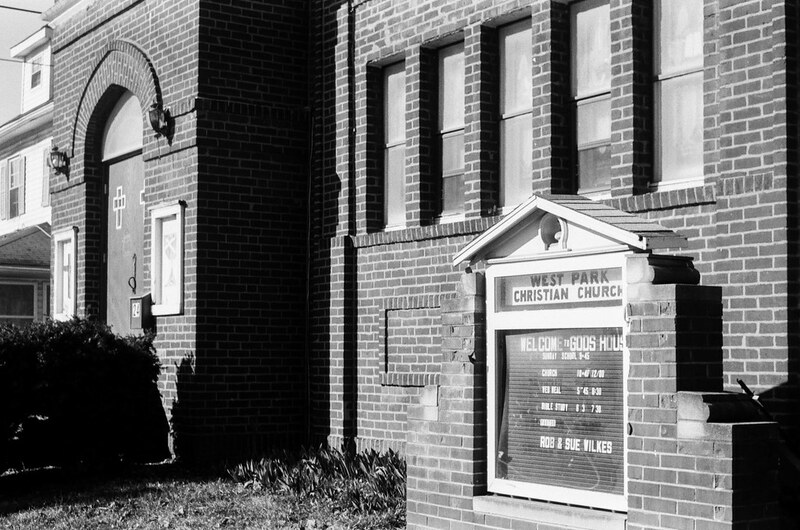 This is a much better result: less intrusive grain, no blowouts, good tone and contrast and detail. This frame required no processing in Photoshop to look this good, although I did crop it a little. Processing and scanning aren’t the whole story, of course. This was a mostly cloudy day, so the sun wasn’t so intense. I’m thinking I need to buy a little more Kentmere 100 and let Old School Photo Lab process it all. Maybe the Kentmere likes whatever soup they’re using better than the soup at Dwayne’s. Being good at guessing how far away things are is a mighty useful skill when you’re a camera collector and a cheapskate like me. A vintage camera with a rangefinder, which takes the guesswork out of focusing, always costs more than the same camera without a rangefinder. Sometimes a lot more. Not having to guess your subject’s distance is apparently worth a lot to collectors. Zeiss Ikon is one of those names that makes camera collectors go weak in the knees and part with large sums of money. Those sums seem large to me, anyway, given that the most I will pay for a camera is $50. Zeiss Ikon’s optics are said to be worth tall stacks of bills, and so of course I have long been curious. Hoping to catch a price break, I started looking for rangefinderless Zeiss Ikons – and almost immediately stumbled across this one. Unbelievably, I was the only bidder. I got it for $10. Woot! a sweet single-throw winding lever and a big, bright viewfinder. 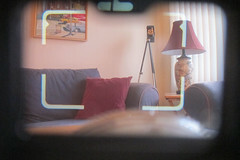 This photo’s a little crude, but it’s a testament to the viewfinder’s size and brightness that it was possible at all. At top center is an oval with a notch at the top. The light meter is connected to the needle within. For correct exposure, it’s a simple matter of twisting the aperture and shutter speed dials on the lens barrel until the needle is nestled in the notch. Another exposure indicator sits on top of the camera, next to the accessory shoe. Exposure is right when the needle rests between the two red triangles. I suppose this is useful when you shoot from the hip, as you might in street photography. Maybe I need to find the guts to go downtown and try it out! I can’t figure out why you’d need this otherwise. The Contessa LK judges exposure with a selenium light meter, coupled to either the aperture or shutter speed depending on how you set the black lever on the lens barrel. Selenium meters have the advantage of requiring no battery, but the disadvantage of wearing out. I hear that selenium meters last a lot longer if they stay covered when not in use. My experience bears that out – among my cameras equipped with selenium meters, those that arrived inside a case or a bag still responded to light, and those that didn’t, didn’t. I deeply appreciate the giant film-rewind crank on this camera. It makes rewinding so much easier. You press a little button on the camera’s bottom and it pops right out. By the way, if you like cameras like this you might also enjoy my reviews of the Agfa Optima (here), the Voigtländer Vitoret LR (here), and the Kodak Automatic 35F (here). Or check out all of my camera reviews here. 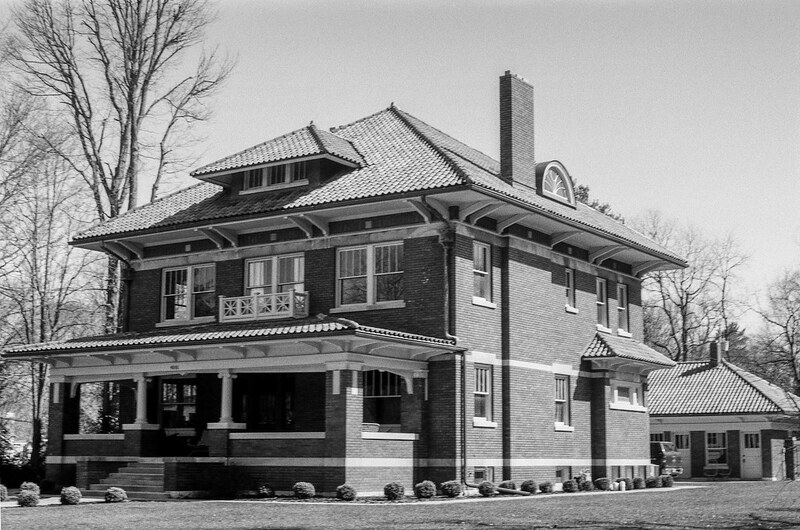 On a trip to the central Tennessee hills I packed my Contessa LK and a couple rolls of film – one color (workaday Kodak 200), and one black and white (Fujifilm Neopan 100 Acros). It didn’t take long for me to get the hang of this camera. Except for focusing, I was able to do everything with the camera at my face – set exposure, snap the shot (the shutter button has a nice short throw), and even wind to the next frame. This lens has character. This is my favorite photo. I love how you can count the rings in that first post. It’s interesting to compare this photo of the bridge over Byrd Creek with a similar photo (see it here) that I took a few minutes later with my Canon PowerShot S95. 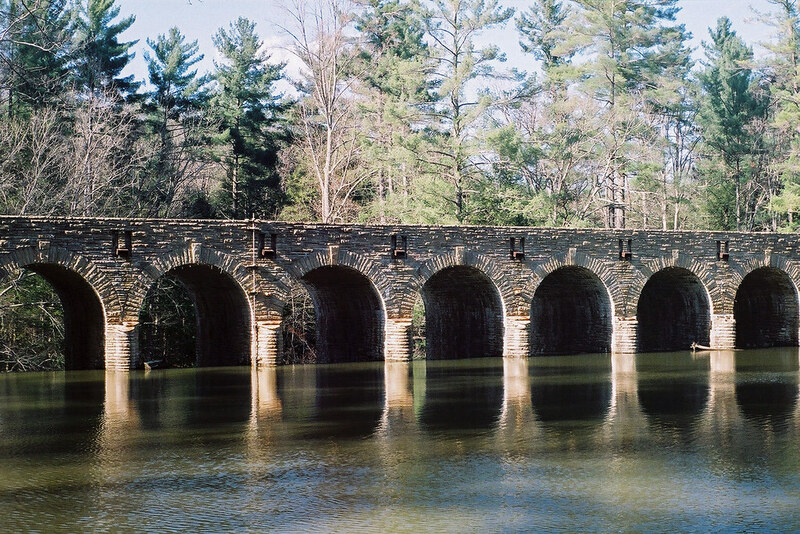 The S95 captured much more vivid blues, but the Contessa LK really brings out the texture of the bridge’s stone face. The shadows were crisp one morning. 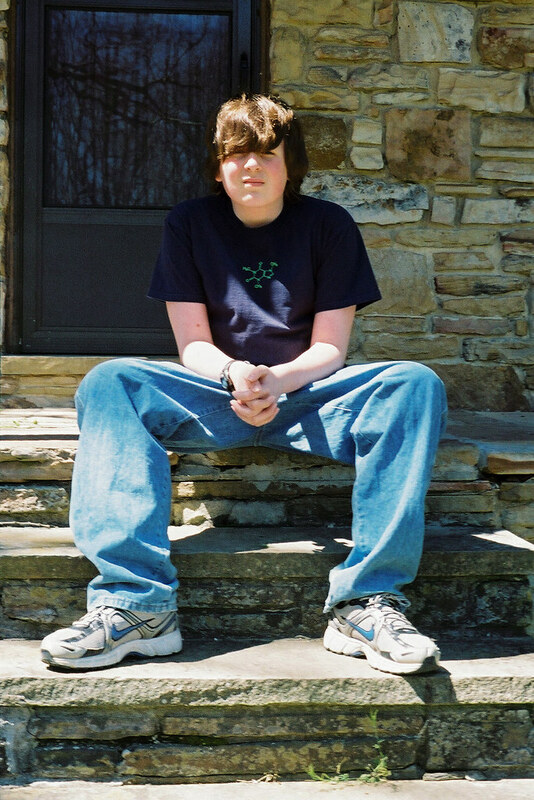 The Contessa LK did a reasonable job on this portrait of my son, who needed a haircut. As I researched this camera, I read a couple comments praising this lens’s warmth. I think that comes through in this shot. 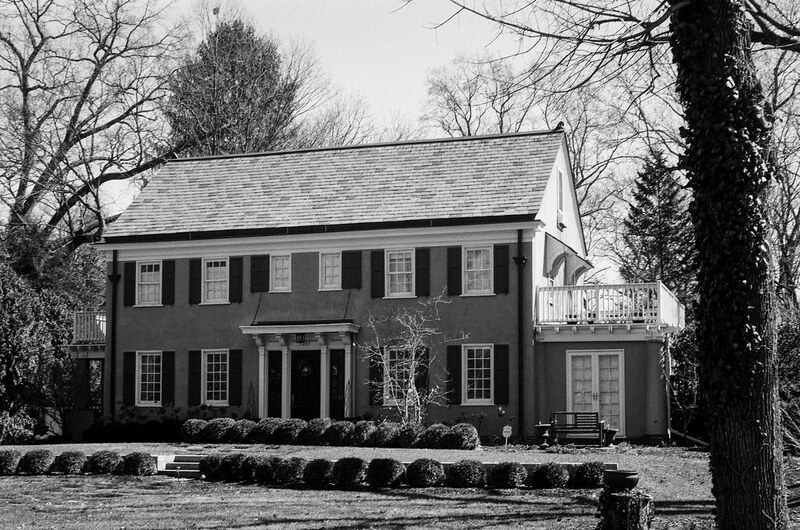 I had serious trouble with the black-and-white roll, 36 exposures of Fujifilm Neopan 100 Acros. Rewinding was labored and difficult, and halfway through the film tore apart. I discovered it when I opened the camera and fogged the film still wound around the takeup spool. I was depressed for the rest of the day! 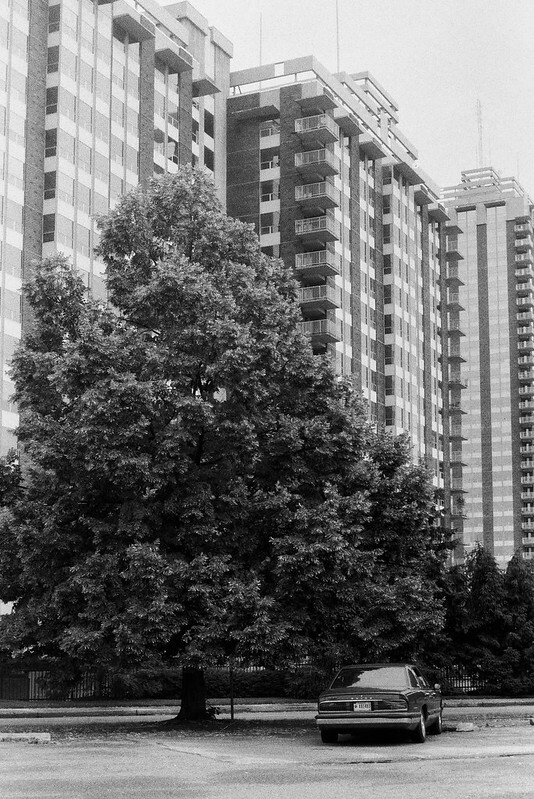 Much later I tried again with black-and-white film, this time some Kentmere 100 — in a 24-exposure roll. I’m not a fan of this film. Of all the cameras I’ve ever shot it in, the Contessa LK is the only one to get decent work from it. Just dig that great detail — it looks like you’d feel the bark’s texture right through your screen. 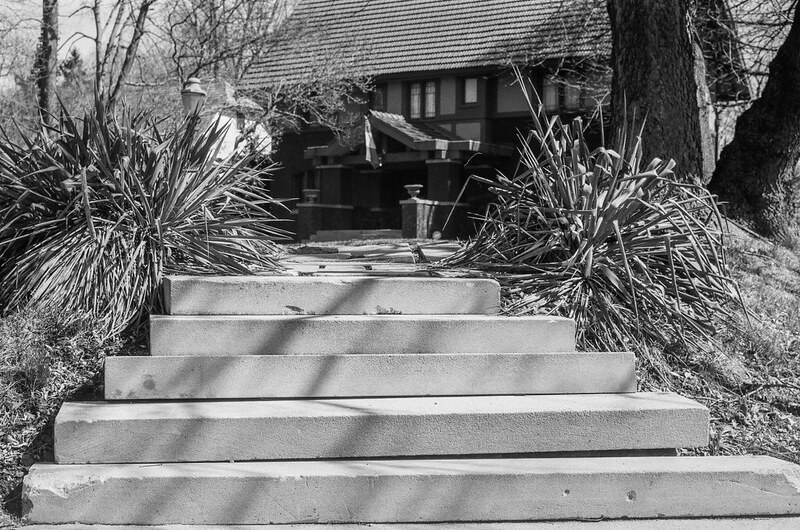 I also shot some Ultrafine Extreme 100 on another outing. It performed very well. This just might be one of those cameras that likes any film. I was pleased with how easily the Contessa LK handled. The controls feel good under the fingers and I quickly adjusted to their locations. Except for having to move the camera away from my eye to set focus, using this camera felt smooth and easy. 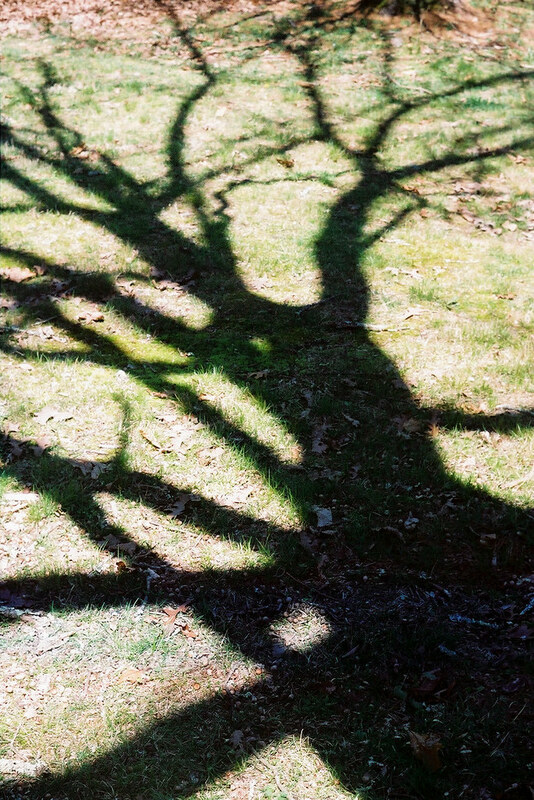 To see more from this camera, check out my Zeiss Ikon Contessa LK gallery. 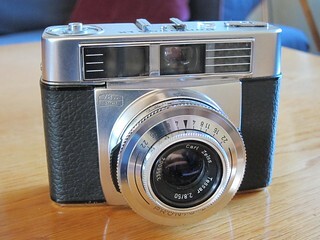 The Zeiss Ikon Contessa LK is a winner. You may not find one for ten bucks like I did, but you should be able to get one for under $100, have plenty of fun shooting it, and get good results every time. Here’s hoping the trouble I had with that one roll of 36-exposure film is not common to this camera.